Which war--and I use the term in the most traditional, literal sense--has claimed more lives than any other since World War II? Answer: the war in Congo that began in 1996 and continues till today. I find it absolutely remarkable that most people don't even know there is a war in Congo. It is barely reported on. "In 1996 the brutal civil war in Rwanda spilled into neighboring Congo, triggering a conflict that has seethed for 12 long years, claimed more lives than any since WWII and received little acknowledgment or aid from the international community. AP correspondent Mealer spent three years in this shattered land, and his book is a perceptive, empathetic, stomach-twisting presentation of the human condition during chaos. Mealer depicts war and peace as the mighty arms of a hurricane; war hurtles thousands of terrified people into the bush; intermittent peace lures the lost ones home. Individuals and institutions, indigenous and Western alike, are overwhelmed by the confluence of political collapse, economic disintegration, international indifference and a generalized military ineffectiveness that prevents resolution of the conflict on any terms. The vivid vignettes of combat and its aftermath portend a forever war, and the author highlights the impotence of grassroots solutions that render any deliverance ephemeral at best. 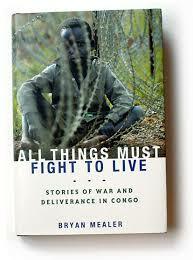 Mealer's book is a quiet paean to the courage he has witnessed, and its final salute to the many proud people of Congo is as much eulogy as affirmation." This is the description, by Publishers Weekly, of a new book called "All Things Must Fight to Live." A prayer: Lord, I pray for Congo. Replace the hate with love. Send your workers in. Bring about breakthroughs among international decision-makers. Help it to rank higher on our agendas. In Jesus' name. Amen. Thanks for this sober reminder re. the recent history of the Congo. Indeed, there has been an estimated 5.5 million people killed since 1998. Most of these as the after affects of disease and starvation. The recent note from John Hanley is an interesting addition, as he has recently visited. Most believe that the war has officially stopped as of 2003, but the malnutrion death toll has been staggering. Thanks for this insight, Quistian. I did not know about the malnutrition death toll. Being informed about this helps us all pray. .. I also intend to look into how much fighting is still taking place.